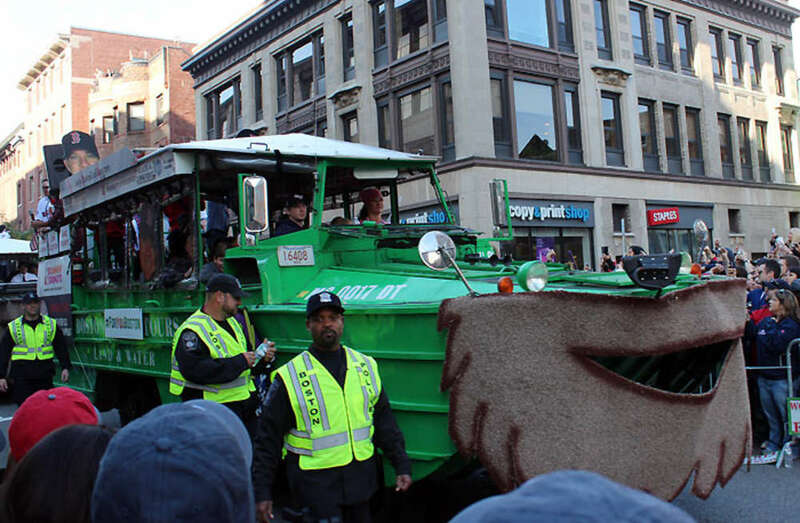 Photo: Even the "duck boats" sported scraggly beards at the 2013 Red Sox World Series "rolling rally" parade. © Arthur Levine, 2013. We&apos;ve been through this before. With the embarrassment of riches that our sports teams confer on us, amphibious "duck boats" loaded with various Celtics, Patriots, Bruins, and Red Sox -- especially the Sox -- have gone around the block a few times lately to share their championship trophies for victory lap "rolling rally" parades. But this time was different. Sure, the improbable transformation of a last-place to top-of-the-world team in one season was impressive. Near miraculous even. And yes, the altogether hairy 2013 Red Sox came through some hairy moments to redefine the term "clutch hitter." The Sox are behind three runs going into the final innings of the game? And they have two outs? No problem. They&apos;ll just load the bases and hit a grand slam. Again. 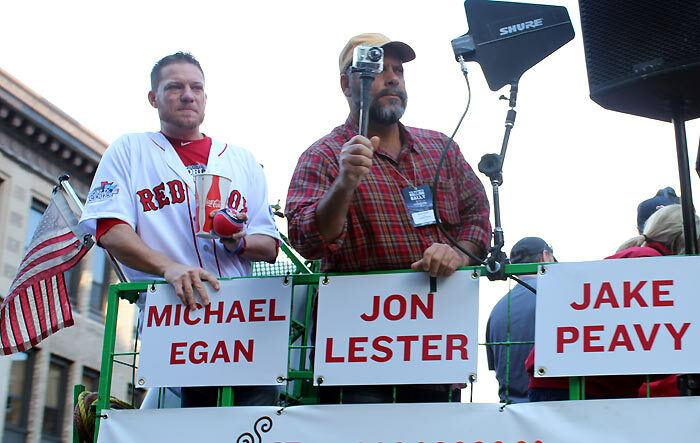 If any band of idiots deserved to hoist a World Series trophy high in the air this past Saturday and parade it through the streets of Boston, it was this hirsute horde. Photo: Red Sox pitcher Jake Peavy at the rolling rally. © Arthur Levine, 2013. But the arc of this inexorable worst-to-first team was linked to a larger story. It began early in the season on Patriot&apos;s Day when the bombs exploded a couple of miles away from Fenway Park at the Boston Marathon finish line. Our city was shaken to its core, but our Boston Strong ethos was never dimmed. The Sox, led by David "This is Our Bleeping City" Ortiz, characterized the ethos and adopted a we-shall-overcome attitude. The Red Sox rallied all season. The postseason was spectacular. Big Papi, who, according to the natural order of things, should be in the twilight of his illustrious career, rallied to a .733 batting average against the Cardinals in the World Series. It was his gift to a shaken city. Winning baseball&apos;s big prize, at Fenway Park no less, was the team&apos;s contribution to Boston&apos;s redemption. The story, which began in April with tragic chaos along Boylston Street, came full circle as the parade vehicles made their way down the same street on a glorious November day. A different kind of pandemonium erupted when Ortiz hopped off the float and defiantly, if jubilantly, jogged a few blocks to cross the Marathon finish line. Like gazillions of other grateful fans lining the streets, I was happy to be there to witness the palpable joy. The rolling rally halted for a few minutes as players Jonny Gomes and Jarrod Saltalamacchia placed the World Series trophy on the ground at the finish line and draped it with a Boston Strong Red Sox jersey. The gesture was for the bombing victims and their families. It was for a city that, like the championship team, has rallied and persevered in its own way. Whether you are a proud member of Red Sox nation, wherever you may live, or whether your allegiance is with another team, we invite you to visit our fair city. See Fenway Park for yourself. Ride a duck boat (which, unfortunately, likely won&apos;t have any Red Sox players aboard). Stroll down Boylston Street. Experience the place where, by sheer force of will, champions rise to a cause. Photos: 3. 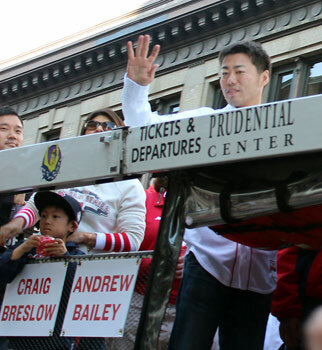 Remarkable relief pitcher Koji Uehara gives a split-finger wave to the crowd. 4. 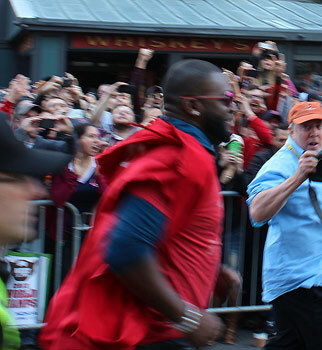 David Ortiz jogs up Boylston Street to cross the Marathon finish line. © Arthur Levine, 2013.